this is part X in the “wrong side XI” series, where i’ll be selecting my very own starting eleven, assuming of course that i could choose any player from any team in the world. you can read the rules i’ll be following to make my team selection, and what formation i’ll be squeezing them into, on the first post in the series. my shortlist for left mid compiles players from all over the world: argentina, wales, belgium, portugal and spain. At long last… we finally reach the front three of my hypothetical team. It’s been a long time coming, considering that this series was originally intended to wrap up prior to the end of Summer 2011. And while I’ve spent roughly the last 10 months (occasionally) working on this project, debating relatively boring positions, we’ve now crossed the threshold into the so-called “glamour” positions. Whether you want to call this player a forward, an outside midfielder, or a winger, he’s almost exclusively an attacking player. Sure, my formation defines this position as one of the five in the 4-5-1. But in practice, it’s a position that behaves much more like one of the forward three in a 4-3-3. In general, I expect these players to attempt to receive the ball high and wide on the touchline. From there, they can do what they like: drive further forward on the flank, cut into the middle, or drive in a cross. In fact, I expect a large majority of my attacks to funnel through the left or right mid’s feet as I would instruct my players to look to the wings as option #1. Defensively, I just want them to high pressure when the ball is near, and track back whenever the other side breaks. The job of picking this player, as you might expect, isn’t very easy. The primary reason for this is the cornucopia of wide attacking players that I enjoy watching. The second is because many modern wingers are becoming more and more ambidextrous in their wing of preference. But I’ve got a good set of contenders in mind that I doubt many would argue with… jump past the break to see if you would or not. lavezzi's a tough little dude, and has skills and speed to match. Instantly more familiar to the masses after bagging a brace against Chelsea in this week’s midweek Champions League fixture, the Argentine has actually been integral part of Napoli’s rise to prominence over the last several seasons. And though he’s a vital part of the Azzurri’s potent three-pronged attack — along with Marek Hamšík and Edinson Cavani — he’s probably the least recognizable of the three. Part of the reason for that is that Lavezzi’s a short, stocky player for a winger… he just doesn’t look like he would be that impressive. However, a lot of his prowess is actually due to his stout, 5’8″ frame. It affords Lavezzi a very low center of gravity, which when paired with his muscled build, means he’s very hard to push off the ball. On top of that, he’s very quick in the way that you would think of Messi as quick: incredible bursts of speed, extremely tight, controlled footwork and a very industrious work rate. Round that off with the fact that El Pocho — meaning “the chubby guy” — has also averaged a goal in nearly every four games Napoli, and you can see why I rate him so highly. My biggest concern with Lavezzi, though, is his penchant for being overly aggressive. His style could easily be described as a pitbull on the flank, as he’s quick to boil over. When he keeps his head, he’s a fantastic player. Though seeing the Argentine give up his favored #7 kit for Cavani upon his arrivale in Naples, it seems he could be getting his head in the right space. everyone that's anyone in europe is chasing hazard's signature. He’s the hottest prospect in Europe at the moment, with no less than four Premier League sides being linked with summer moves for Lille’s most prized possession (Sorry, Joe Cole). Whether he can cut it in England remains to be seen, but there’s no doubting that young Belgian prodigy has been lighting Ligue Uhhnn on fire for at least the last few seasons. Capable of playing anywhere across the midfield — versatility has to be one of my favorite assets — Hazard seems most at home when placed out on the left wing. He loves to cut inside to his right from the left, and run straight up the opposing side’s central defense. However, he often demonstrates that versatility by switching flanks with the rejuvenated Joe Cole through the match, confusing the hell of out of their opponents in the process. He has a relatively devastating arsenal of tricks up his sleeve for a kid only at the tender age of 20, and his ability to execute them at pace has drawn comparisons to a certain Portuguese player of note. So if I like the kid so much, why does he sit so low? While many might assume it’s because he’s not played in any of the “top” leagues in Europe yet, I actually think he’s more than capable of cutting it at that level. What does concern me though, is that several of his managers have accused him of lacking the passion, the work ethic and/or the “charisma” to make the most of his extraordinary skill set. And while he’s young enough to reverse that type of perception, I’ll need to see how he performs after his next big move before crowning him champ. despite his current club allegiance, mata is one of my favorite players at the moment. Mata is an intriguing player for a myriad of reasons. He’s been the lone bright spot in a bleak season for Chelsea, their only player that understands that they can’t constantly heave the ball down the opposition’s throat in AVB’s 4-3-3. Even more interesting however, is that though I originally favored him as a wide player, he’s shown himself to be even more effective from a central position this season. 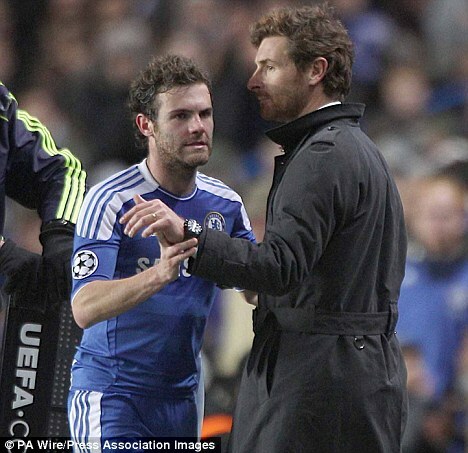 The “AVB Mini Me” is more than capable of delivering fantastic service from the wing, but also has a staple of tricks with which he regularly uses to make fools of opposing defenders. But most of all, it’s his on the ball intelligence that makes him stand out as one of the finest wingers on the planet. He’s a Spaniard through and through, and you can tell as he often looks want for a bit more tiki-taka from his fellow teammates in England. Despite having only made a relatively meager number of caps for Spain and having only been with Chelsea for about a half season, Mata’s adapted to both the sides with impressive speed. He’s already scored five times for both the Blues and La Furia Roja, and has been the creative force behind quite a few other goals. He seems to have a good head on his shoulders overall, and has been a steadying presence in a very disjointed Chelsea side… at least when Villas-Boas gives puts him in the middle. It’s for those reasons that I had a hard really hard time not picking Mata for my starting spot, as clearly I rate him very highly. I wish he didn’t play for Chelsea: you know, it’s hard to root for a guy whose team I don’t particularly like. But considering the form of the two players ahead of him in my rankings, I think you’ll understand why I had to bump him down a few places. bale has managed to expand his game over the year, making him a much more potent offensive threat. I know, I know… Bale was my starting selection for left back way back in May. But to be perfectly honest with you, that was really just me finding a way to squeeze my favorite player into the squad. Anymore, he’s clearly proven that he has morphed into a full-fledged attacker/winger, and thus making my selection look a bit unwise. I don’t doubt that he could play there adequately, but someone else probably would be more effective. But like I said above, Bale has become a marvelous attacking winger. Aside from player above him in this list, there’s not been a better predominantly left-sided winger on the planet in the last 12 months. Everyone knows about his ridiculous pace, and thunderous left boot. But what’s really changed in his game since I picked him for LB nine months ago is how he’s diversified his attacking abilities. No longer is he a guy who can only beat you up the line, but he’s started switching flanks and cutting in through the middle too. Yet despite the fact that he’s been absolutely electric for Spurs this season, I can’t pick him for this spot. For one, it’s because he’s already starting elsewhere in the side. But two, because excluding the next man on this list is simply unacceptable. i'd have to be a fool not to give ronaldo the starting nod. What can I really say about Ronaldo that you don’t already know? As is noted above, the man has collected just about every major accolade that a footballer could net in the last five years, so there’s really no disputing his credentials. Ronnie’s got pace, power, trickery and a nose for the goal… not to mention just a touch of arrogance needed to tie that skill set together into what you could call a “pure footballing machine.” Someone even filmed an entire mini-series about it. At the moment, Cristiano is undoubtedly the most in form goal-scorer on the planet. While some might argue that Messi would be better — I’m not disputing that the Argentine is a better all-around player, which he is — but Ronaldo’s superior minutes per goal ratio is enough to sway my opinion. Sure, he’s been labeled as a guy that can’t perform in big matches, and he has some way to go to prove otherwise. Yes he’s a tad arrogant, but his work rate has significantly improved since Mourinho’s arrival at Madrid. But even considering those “drawbacks’, there’s absolutely no way that you can create a team and select any players you want and not select him. He’s one of the top two players on the planet right now, and even if you don’t like him as a person, you’d be wrong if you didn’t. So Ronaldo ends up taking the first of my front three spots… who could I possibly pick to join him? With only two spots to fill in my starting XI — and a lot of big names still being left out in the dark — the options feel nearly limitless. Be sure to check back soon to find out just how devastating a front line my imagination can construct.